27m², 2 bedrooms, terrace with garden furniture, separate WC, well equipped, well appointed, comfortable, nice. 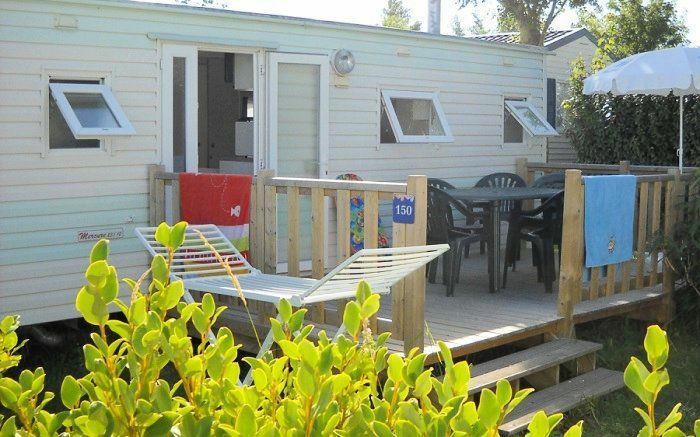 Penmarc'h Located in southern Finistère, Camping Les Genêts **** welcomes you for a family holiday by the sea. Its location 1.5km from the beach will delight young and old. On site, you will enjoy the heated indoor pool with its whirlpool, water slides, paddling pool with water games for children, petanque and volleyball courts, ping-pong tables. New for 2016: New aquatic area with fast river, massage gun, water umbrella, whirlpool, waterfall. The campsite will offer evening entertainment: cabaret, disco, concerts, quiz or bingo. In July and August, activities will be organized for children from 5 to 12 years old. For your comfort, the campsite offers a free WiFi zone, a launderette, rental of sheets, a bar, snack and restaurant, a bread and newspapers deposit. Nearby, you can practice many water sports on the spot of Pointe de la Torche (4 km): surfing, windsurfing, kite surfing, sand yachting, stand up paddle, sea kayaking, body board or diving underwater. Mobile Home 3 Rooms 4 Persons of 27m ², composed of a corner cooks equipped, a corner living room, a room with a double bed, a room with 2 simple beds, a room of shower, WC separate, from a terrace. The Mobile Home includes a kitchenette equipped with microwave and coffee machine. Blankets and pillows are provided. The terrace has a garden furniture and a parasol.